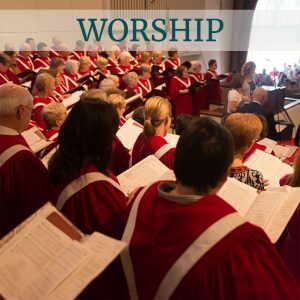 Trinity Baptist Church values biblical worship, which stresses the presence and the majesty of God. Worship should be God directed. Worship should inform, challenge, and encourage the believer. Worship should declare God’s message of love through Christ. Worship should involve all of the senses and the intellect. Worship, there is a sense of God’s presence in the hearts and minds of each worshipper. The ministers and other worship leaders are prompters, leading God’s people in individual and corporate communion with God’s Spirit, the recipient, or audience of our praise and worship. True worship brings out every single emotion or concern of our souls. When worship really happens, we are never content to leave and remain as we were before the worship experience began. This encounter with God exposes our failures, causing us to confess our sins to Him as we seek to become righteous in His sight. God’s presence is always an occasion to sing praises and rejoice before Him. Worship creates happiness in our cleansed and grateful hearts toward God and our fellow man as we leave God’s presence and go forth to share with others what has transpired in our lives. Won’t you worship with us weekly at the following services? On Wednesdays, beginning April 24, Dr. Jeff Roberts will be facilitating a study entitled, Unafraid: Living with Courage and Hope in Uncertain Times by Adam Hamilton. Fear is a complex emotion. Sometimes it saves us. More often it robs us of all the life we want. But we can take our lives back.